At Twilio we love to help out events by partnering with them to build apps that let the organizers and attendees communicate better. This year, for Silicon Valley Code Camp (SVCC) we partnered with organizer Peter Kellner to build an SMS-powered session change notification system that would alert attendees to sessions that had to be canceled or moved to a different room. The SVCC regularly draws upwards of 2500 attendees during the event so we knew that we could be sending out a lot of messages over the weekend, potentially in bursts of several hundred at a time. Peter also wanted a way to be able to get delivery statistics from the system, so we’d not only have to have a way to send out notifications, but also a way to get delivery notifications back to Peter. Complicating those requirements, Peter, who had already spent a lot of time building the SVCC website, wanted to avoid introducing any major new components (like an SMS notification system) directly to the code camp web site. That meant we’d need a system that could operate completely decoupled from the existing site. The solution we devised combines several different Azure services, glueing them together with just a few lines of Node.js and C# and exposing them to the SVCC website through simple HTTP API’s. 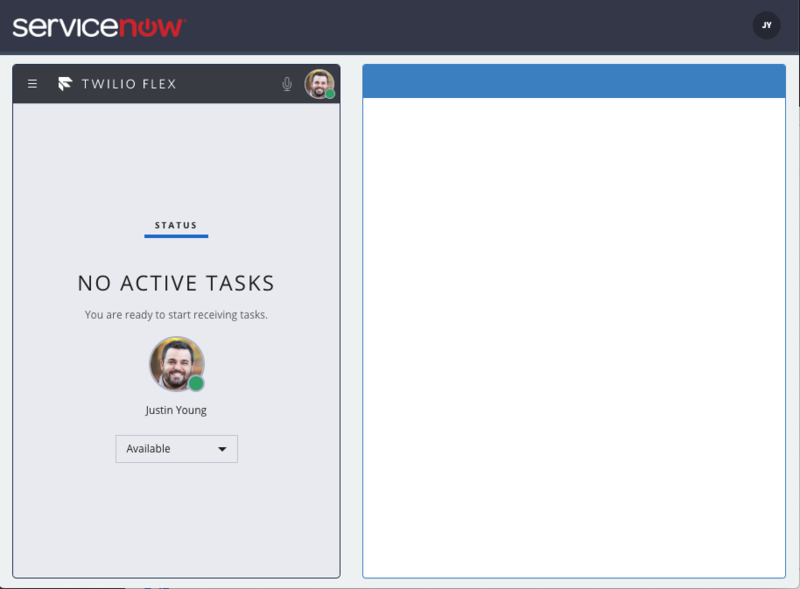 Working part time and in two different time zones, we built, tested and deployed it in just under a week. In this post I’ll walk you through how you can build and deploy your own SMS notification system using these same technologies. If you want to skip ahead and check out the code needed to build the system, head over to Github. In order to complete the walk-through you’ll need both a free Microsoft Azure account and free Twilio account. If you need to, go ahead right now and create those two accounts and then come back and read on! Now that we have a better idea how the Azure services we’ll be using fit together we can start building it. Let’s go! We’ll start building our notification system by logging into Azure and creating a new Storage service. The Queue capability of the Storage service provides a basic first-in-first-out (FIFO) queue and serves as the backbone of our system. With the Storage service added we can now create an HTTP endpoint where you can make simple POST request to insert new notifications into the queue and a data table that will store those notifications once processed. To do that we’ll set up new Azure Mobile Service and use its Custom API and a Data Table capabilities. Once the service is created, open the Data tab and add a Table named Notification. We’ll use this table to store the notifications that we have sent. 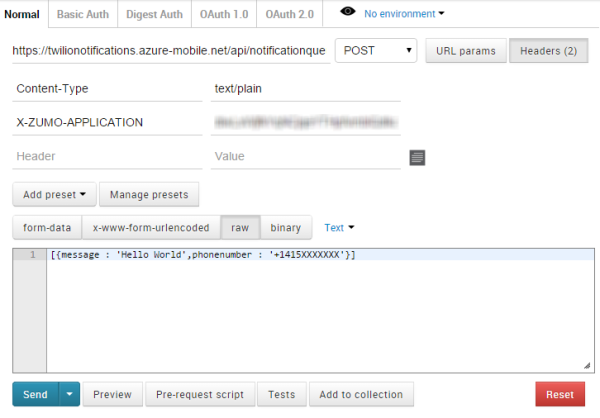 Now, switch over to the API tab of your Azure Mobile Service and create a new Custom API named notificationqueue. Set the GET Permission drop down so that Everyone is allowed to make requests to it. We’ll start by modifying this boilerplate to require the Microsoft Azure SDK for Node.js. I’ll make these changes using the code editor available in the Azure portal, but you can also take advantage of the source control option in Azure to store your code in a Git repository. Adding the SDK allows us to access the storage service we created earlier. We need to make sure that the queue we’re going to use exists and if it doesn’t, to create it. Fantastic! We’ve now got a service that we can use to accept new notifications that we want to send and add them to a queue for processing. With the request body in place, we next need to set a couple of request headers before we send the request. First, even though we are passing JSON formatted data in the request body we want Azure Mobile Services to treat it as plain text, so we need to set the Content-Type header to text/plain. 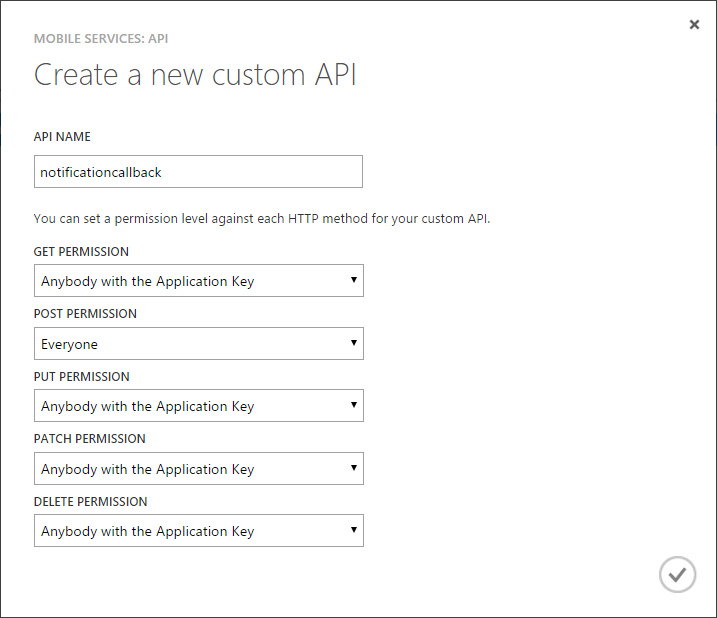 Second, because the permissions set on the Custom API are set to “Anyone with the Application Key”, we need to include the application key in our request. 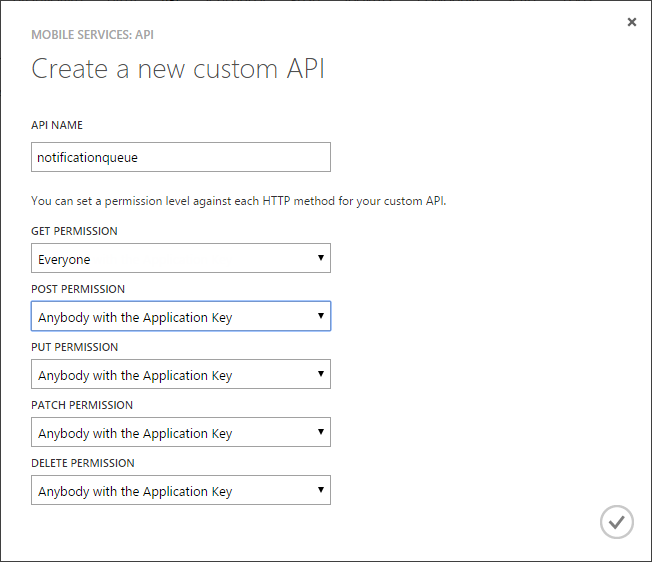 Azure Mobile Services expects us to pass the application key using a custom HTTP header called X-ZUMO-APPLICATION. If everything goes as planned when you send the request to your Custom API you will receive a 200 OK response from the service telling you that the service successfully added the message to the storage queue. Next we’ll build the WebJob that monitors that queue and sends out notification text messages as notifications are added to the queue. WebJobs are runnable scripts or executables that you deploy to Azure in order to run regularly occurring jobs or batch work like image resizing, text processing or any task that you would expect to execute in the background. 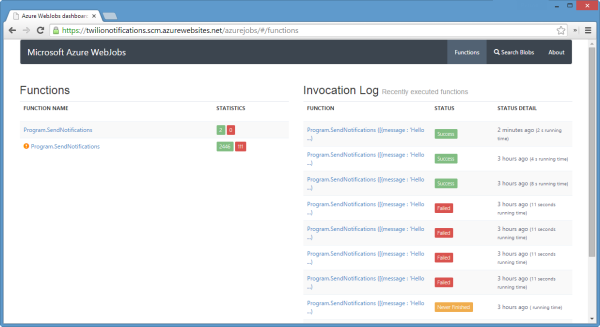 In our system we’ll use a C# Console Application as a WebJob to monitor the storage queue and process notifications. Awesome. Let’s write some code. Notice that we’ve decorated each property in the model with the JsonProperty attribute. This attribute will help us use the JSON.NET library to parse the JSON that the application pulls out of the storage queue into a list of strongly typed Notification objects. Now head over to the Program.cs file and we’ll write our console app. Start by making sure that the Program class is marked as public. Next, create a new instance of the JobHost class. This class is what looks for runnable methods inside the application and listens for trigger events in order to execute jobs. When creating a JobHost you can pass in a configuration. In our case we’ll configure the host to poll the storage queue every three minutes. Finally we call the RunAndBlock method which runs the host and blocks the current thread. Now we need to create a method that the job can run when triggered. Create a new method named SendNotifications and have it accept a single List. For now just have the method write a message out to the console. We’ve decorated the single method parameter with the QueueTrigger attribute. This attribute tells the WebJob that this is the method we want it to run whenever it finds a new message in the storage queue storage queue named twilionotifications. That’s all there is to writing a WebJob, so lets give it a spin. Go ahead and run the console application and use Fiddler or POSTMAN to send some notifications to the queue. You should see that the console application has found the message on the queue and the SendNotifications method has run. Now that we’ve got a functioning WebJob we can make it process the incoming list of notifications, adding each to the Notifications table and sending a text messages. Start by pulling in the credentials that we need to connect to Mobile Services and Twilio and open a connection to the Notification table. Make sure you replace the values with your specific service information. Let’s break down what’s going on in this new code. For each Notification we receive, we first build a callback URL that Twilio can request when the delivery status of a text message changes. Next, we insert the Notification into the Notifications table. Then Twilio sends the notification text message using the Twilio .NET helper library’s SendMessage method. Finally, we take the result of sending the text message and update the Notification in the Notifications table with the unique ID of that text message and its status. Give it a try. Run the console application and try queuing a new set of Notifications. This time you should see the console application telling you it’s sending messages to the numbers you included in the set of Notifications. If you included your own phone number in that set, you should get a text message delivered to your phone. With messages now being sent out we can take a moment and see how to make that code more robust. If the Notification does not include a phone number, we update the record in the Notification table to indicate that the input we received is not valid. Next we’ll add a bit of error checking around sending the text message. The Twilio .NET helper library will catch exceptions returned from the Twilio REST API and expose them via a property called RestException. If the RestException property is not null we know that the REST API returned a status other than 200 OK, which means an error occured. If that does happen we update that Notification in the Notifications table with the details of the error. Brilliant. We now have a reasonably robust system that allows us to queue Notifications, monitor that queue and then process each Notification by logging it in a data table and sending a text message. The final part of the system listens for Twilo to update a text messages delivery status and updates the Notifications accordingly. Let’s take a look at that next. In the WebJob, the Twilio .NET helper library method we use to send text messages requires a number of method parameters. These include the phone number we want the message to come from, the number it should be sent to and the content of the message. In our application we are also including a fourth optional parameter named StatusCallback. This fourth parameter is a URL that allows Twilio to tell us when the delivery status of a message changes. It does this by making an HTTP POST request to this URL including in the request a set of form-encoded parameters like the updated delivery status. What is delivery status, you ask? When Twilio sends a text message to a phone number there are a number of statuses that message can be in, such as Queued, Sent or Delivered. The full list is here. In our case, the status we want to see is Delivered which tells us that the message was actually delivered to the phone we sent it to. In our app, the StatusCallback URL that we are passing to Twilio points to another Custom API in our Mobile Service, so go ahead and create one named notificationcallback. Because Twilio will make a HTTP POST request to the API, set the POST Permissions to Everyone. 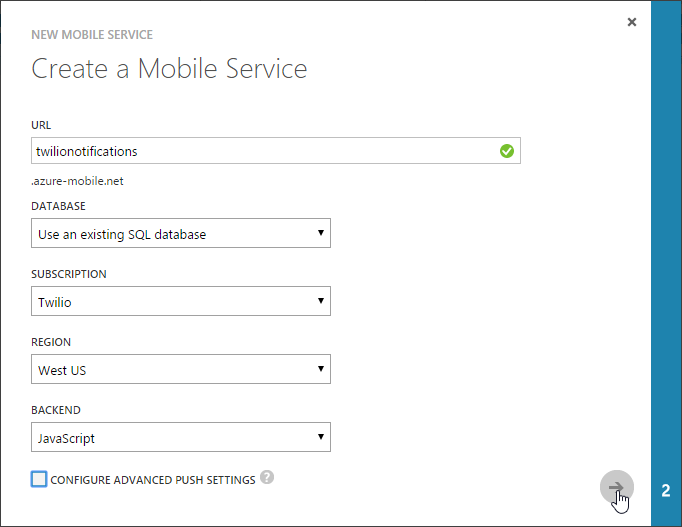 With those parameters we can update the specific Notification associated with the Message Sid in our Azure Mobile Services table with the new status information. That’s it! Run the console application once more and put it through its paces. This time when the text message gets delivered to your phone, Twilio will tell your application about it and the system will update the Notification record. You can check this Notification record by viewing the table through the Azure portal, or by making a GET request to that table. If you’ve made it to this point you have a functioning notification system. However, the WebJob is still running on your local machine. 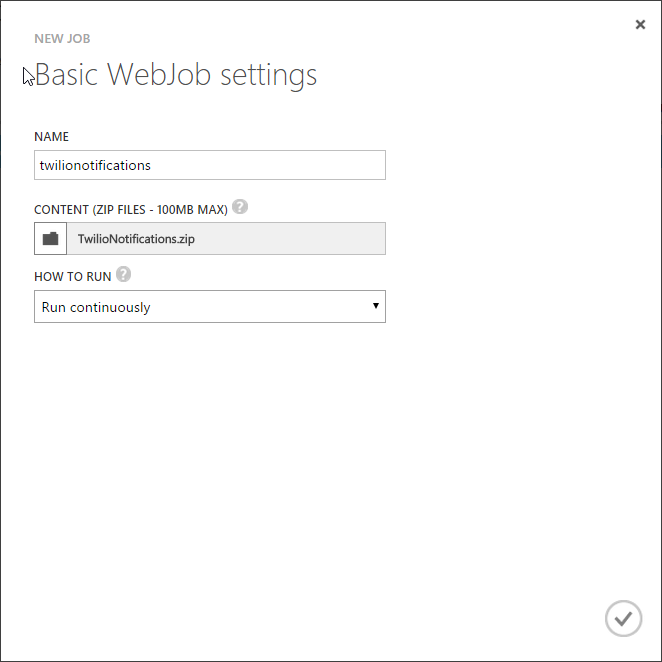 The final piece of the puzzle is to deploy that WebJob up to an Azure Website. If you don’t have an Azure Website created, go create one now. With your Azure Website ready to go, there are a number of ways to deploy the Console Application to it. You can deploy directly from Visual Studio, or set up automated deployment from Git. 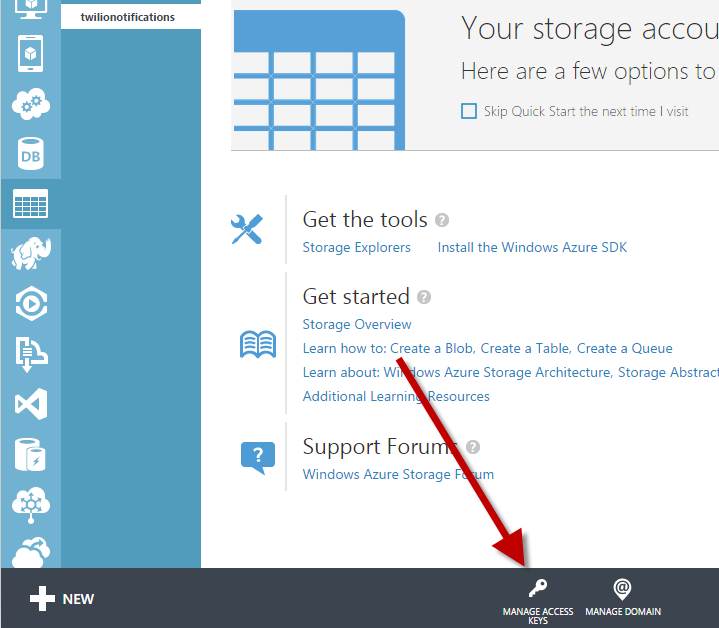 In this section I’ll show you how to upload a ZIP file that contains the application to an Azure Website. Start the deployment process by finding and opening the file path of your WebJob Console Application in Windows Explorer. Create a ZIP archive from the applications executable and dependent DLL’s. Once the ZIP uploads, Azure will extract the Console Applications executable and attempt to run it. When the the executable starts successfully you can begin to monitor the WebJob by clicking on the link listed in the Logs column. This will take you to a basic portal where you can view each run of the WebJob, the payload it received from the queue and any content written to the console. The log portal also allows you to manually replay individual executions of the SendNotifications method, modifying the data provided to the method parameters, which is very useful when debugging. With your WebJob deployed to Azure your system is complete and running fully in the cloud. Queue up some more test notifications and watch in the WebJob Log portal as they get processed and text messages sent. And there you have it. Assembling together different Azure services, Twilio and a little bit of code has netted us a standalone and robust system for sending notifications via SMS and tracking the deliverability of those messages. Even better, integrating the system into existing software is as simple as making an HTTP POST request. After creating all of this in a bit under a week for Silicon Valley Code Camp, we ended up sending well over 2000 messages during the two day conference with only 43 messages failing to get delivered, all from a system that is comprised of less than 150 lines of code. How have you combined together different cloud services to build amazing systems? I’d love to hear about that, or how you’ve deployed this application in your organization. Send me an email at devin@twilio.com or find me on Twitter @devinrader.